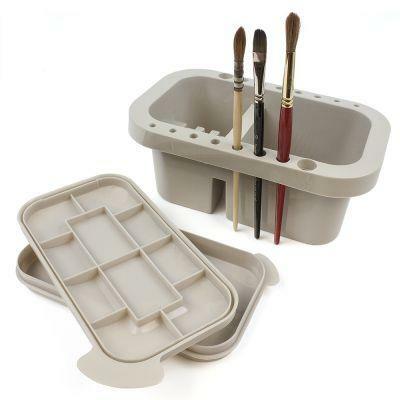 This rectangular brush tub offers a fantastic storage and cleaning solution for your brushes. Made from a durable plastic, the tub features 16 holes for the storage of brushes in various sizes. The tub is divided into two separate sections. The larger of the two sections features a series of ribs which can be used to clean your brushes thoroughly. The smaller of the two sections features some grooves which can be used to suspend the brushes in liquid without damaging the brush tips. A multi-purpose tool, this brush tub also features a removable lid which can be opened to form a palette. The lid is also airtight and so can also be used for storing small items or accessories. The palette in the lid features 10 wells in total. The brushes in the image are not included with the brush tub.